I can’t say that St. Patrick’s Day was ever that big of a holiday for me as a kid, even into early adulthood. Now it has become one of my favorite times of the year. Mainly because of the food, whether it be authentic Irish or just plain green. 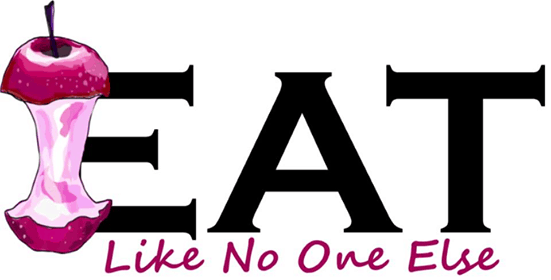 Make a holiday into a culinary celebration and you got my full attention (of my stomach). 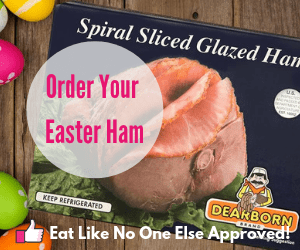 During my last trip to Costco I was thrilled to see a good selection of St. Patrick’s Day products that I couldn’t wait to try out. It lifted my spirits on a day I was struggling with a massive toothache. Now for the benefit of all my readers, I didn’t wait for St. Patty’s day to try these products out. 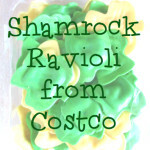 I plan on doing a review of a couple of the things I picked up – starting with Shamrock Ravioli! 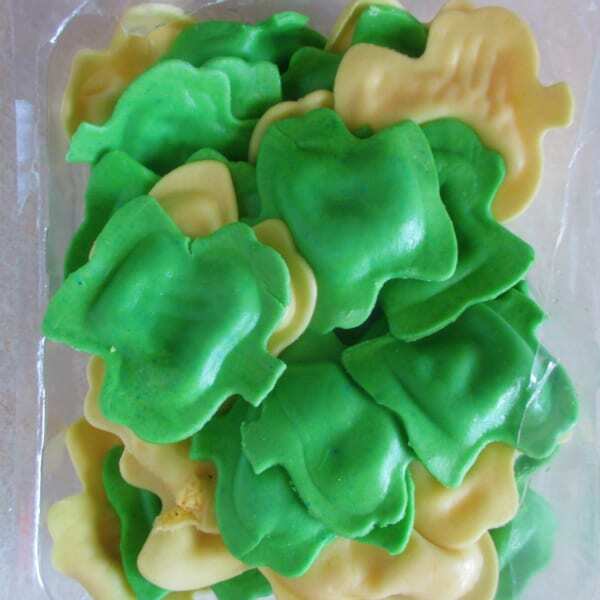 Since 1989, Nuovo pasta has been pumping out colorful and unique Ravoli, Tortelloni, Sacchetti, and more. The company is based out of Stratford, CT. 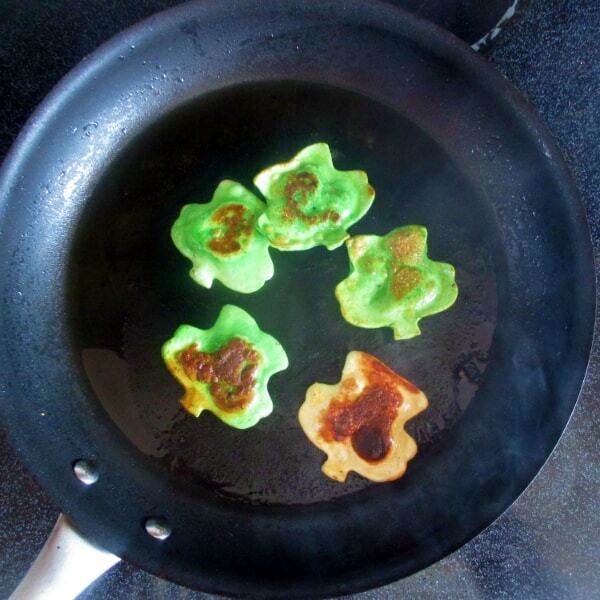 They created a special Shamrock Ravoli for St. Patrick’s Day. 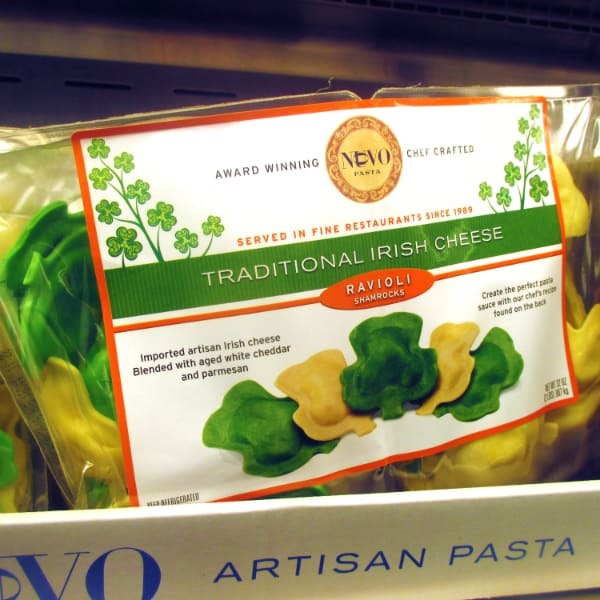 The Ravoli is filled with imported artisan Irish cheese blended with aged white cheddar and Parmesan. 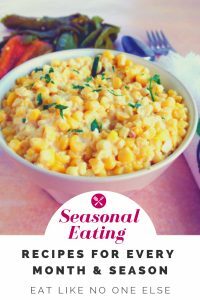 The flavor of the filling is nicely balanced, rich and creamy. The pasta is the perfect thickness, not too soft that it falls apart and not too thick that is overwhelms the filling inside. It comes in a 2 pound double pack. Use one pack today, save another for tomorrow. Each pack contains 1 pound of pasta. Overall cost at Costco is $9.79, which works out to $4.89 per pound. Our household was able to make 4 meals out of it, if you have hungrier older children, might be more like 3. For maximum flavor I use a two step cooking process – boiling and pan frying. A quick boil of abut 3 minutes is all you need. This is a fresh pasta, so its not hard like what you would find in a rectangular box. Don’t overcook it or it could end up falling apart with the filling spilling out. If you don’t use the Ravioli right away, then I suggest pouring a little bit of oil onto it so that they don’t stick together because trust me they will. Just a small coating is needed. Make sure to gently toss it around so that each piece is evenly coated. Step 2 is the pan frying process. This will really add a lot of flavor, so it’s worth your time. This will add a little crunch to the outside of the pasta giving a beautiful contrast to the soft cheese inside. The browning of the outside adds flavor. You just need to pan fry it at medium heat with your favorite oil in the bottom of a frying pan. No more than 30 seconds per side is enough to caramelize the outside of the pasta. Only do a few at a time. Don’t crowd the pan or they won’t brown as fast and as evenly. Now all that is left is to serve them warm with your favorite sauce (tomato, Alfredo, etc). There are some sauce ideas on the back of the package. I have a recipe for a really easy to make creamy tomato sauce below. 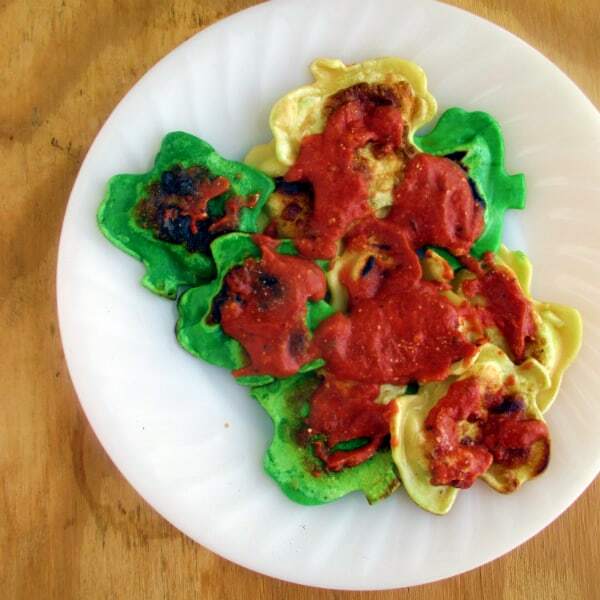 My 3 year old son absolutely loved the Ravioli. He ate quite a bit. My 5 year old daughter ate them alright, but my oldest daughter wasn’t a fan. 2 out of 3 kids isn’t bad, especially when it’s the younger ones! I didn’t fry any for my kids because they seem to not like anything that is too caramelized (see roasted vegetables), so I just saved the frying for the parents’ pleasure. Bring a gallon of heavily salted water to a boil. When it reaches a boil add the Ravioli. Cook for 3 minutes until the Ravioli is tender. Drain. Add enough oil to coat the Ravioli to keep them from sticking. Heat a frying pan over medium heat with enough oil to coat the bottom of the pan. Once hot place the Ravioli on the bottom of the pan and cook until browned about 30 seconds, then flip and cook the other side. Work in batches without overcrowding the pan. Empty a can of tomato paste into a saucepan. Add enough water (or chicken stock) to thin the paste to your desired consistency. Bring to a simmer, then remove from the heat. Add the dried herbs and garlic powder. Add salt and pepper to taste. Serve on top of your Ravioli. Previous Post: « When Does California Mandarins Season Begin (and End)? I can’t find this at Costco store or online?? Maybe it’s possible that they ran out already for the season. They didn’t have a ton of them at my store. Did you call the store and ask? NOT available at Costco in New Orleans, Louisiana (or even Houston, Texas). What’s up with this?? 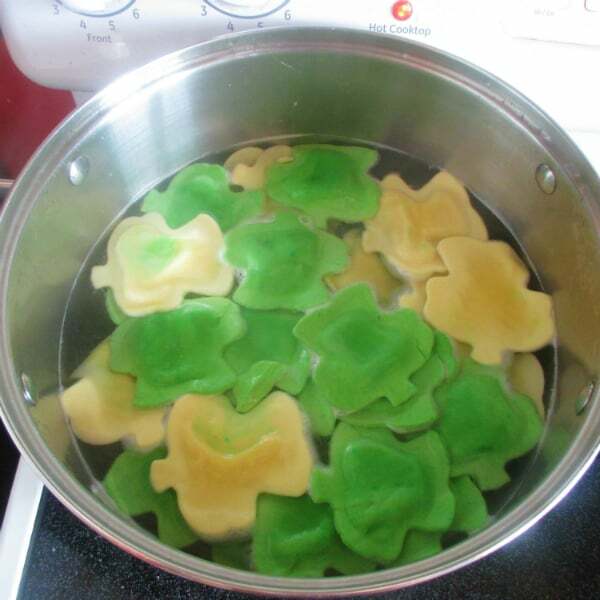 We celebrate St. Pat’s Day with MANY parade/parties. VERY disappointed. Sorry to hear that. That stinks. Maybe it’s not available at all Costco stores this year or they are just selling out fast.